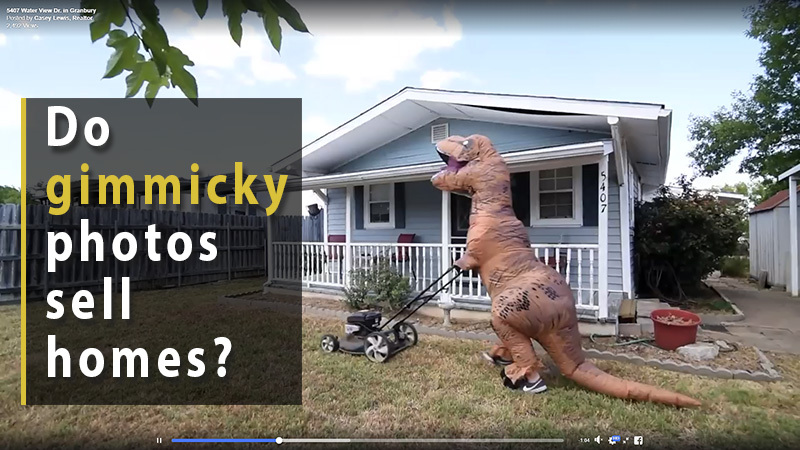 Do gimmicky photos and videos help sell homes? Do you think those videos and photos where agents get dressed up, or do something else that’s gimmicky, actually help to sell homes? According to this article at Forbes, “Dinosaur listing video turns into marketing success story“, the home went under contract in 2 days. A great result! “Feedback has been unbelievable. A number of people have commented about how great and creative the video is. It’s certainly been much stronger than any other video I’ve made. However, Smith’s video doesn’t really show much of the home – just a still of a couple of different scenes in the living room and bedroom. Mahaney said he has not yet received any offers for the Upper Coverdale, N.B., house — which is on the market for a cool $319,900 — though he hopes the video will get the attention of prospective house hunters. But do crazy real estate photos and videos make more sales? Do you think the extra attention helps the real estate get more listings, or do they help the homeowners get a better price or a quicker sale? Ultimately that’s what these videos are trying to achieve, and it would be interesting to know what comes from this in the months after the photos and videos go viral online. On the positive side, any video or photo like this has the potential to work for the agent, and in that regard it’s probably worth trying. As marketers we don’t get anywhere by sitting on the sofa, doing exactly the same thing as everyone else. When we stand out in our market then we might do something that works, so credit to these agents for thinking outside the box and giving it a go. If an agent dresses up in some kind of costume, and it gets some media attention, does that help the agent long-term? Maybe it does, if the viewers respond favorably to the video or photos. If people like it then they’ll like the agent. But if it comes across as weird – in a bad way – then that’s going to backfire on that agent, and that’s not good. Does an agent need to do something gimmicky to stand out in today’s social media world? I think it depends on what they do. For example, the agency listed above that features a lot of supercars is doing professional videos for every home they sell, as well as all of their rentals. That’s a smart plan, and that approach, when there is a consistency to what they do, can help a real estate agency become known and that brings more sales. People like to list their home with a company or agent that is highly professional, and that creates marketing that is exceptional. I think NGU Real Estate, as one example, does that. What about the agents that dress up as dinosaurs, or pandas, or who dances in a clip? These can seem more gimmicky, unless they are part of a broader package that is consistent in its messaging. If an agent creates great work, and consistently incorporates, say, a panda costume in much of their brand then maybe that’s an appropriate step. Although they would want to be sure that such gimmicks do not take away from the ultimate goal of marketing the property. Some of the videos above didn’t get the balance right, and the video was only about the agent in the costume, but others did get the balance in terms of showcasing the home with a bit of a comical twist. If a real estate agent decides that a costume or a dance is not their thing, but they still want to go viral in their market, then they can definitely do that. In my view an agent can become super popular in their local market by simply using high-quality photos, professional videos, and targeted Facebook content that is appreciated by buyers and sellers in their area. Give buyers what they want – top class visual marketing that clearly shows the home and what it offers – and that agent will grow their business. No gimmicks required.